The newly appointed secretary of state in Florida resigned Thursday after a 2005 photo of him reportedly in blackface mocking Hurricane Katrina victims surfaced. The photo, obtained by The Tallahassee Democrat, shows Secretary of State Mike Ertel with brown face paint, wearing red lipstick, earrings and a New Orleans Saints bandanna. Ertel also had fake breasts under a purple shirt that said "Katrina Victim," according to the Democrat. Was it this guy? LOL. Resign for that? What poosey! This is why alleged grown-ups need to leave Halloween festivities to the kids. Put your belongings in a box, and security will walk you out the door. The past is never dead. Yet Booker(the abuser) still has a seat in congress!! Freakin incredible!!! Too stupid to be on the public payroll. And that’s pretty stupid. Appointed by DeSantis. Would DeSantis appoint a democrat? Was he a republican? Usually, Dems don’t step down for that or much, much worse. All he had to do is say, ‘Sorry, won’t do it again’. 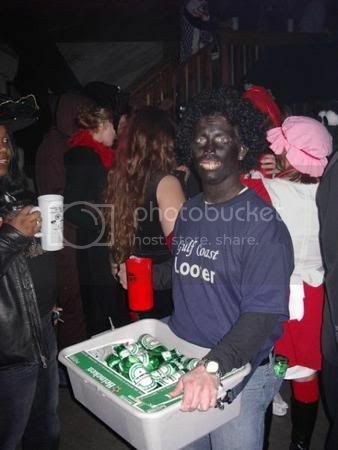 people dressing in blackface during a Halloween Party. Other races ‘misappropriate’ left and right, all the time. Play stupid games, win stupid prizes. Bye, ya’ moron. As the Kavanaugh destruction campaign taught us, all of us must go back in time right away and delete every silly thing we said to buddies on a Saturday night cruising around town in high school, every bold statement that should have been left unsaid, every ill advised romance with someone who turned out to be crazy, and everything that would have been better to have not done in the first place. What? Time machines are only in fiction? Then we can’t un-do what 20-20 hindsight now tells us was a mistake? I don’t know. Probably not. They didn’t say in the linked article. Only problem with that costume is that he forgot the hands.